The entrance to the Bridge is right in front of you as exit the train that takes you to the higher-numbered gates. You go down a small escalator, and then you have the choice of going left or right. To the left is the coffee bar, shower suites, an IT bar, and the Bistro; to the right is the Bakery, the long bar, and a TV lounge. Both sides are pretty similar in terms of seating, but if there’s a specific amenity that you’re looking for, go to the respective side. For myself, I usually head to the right to get some egg tarts from the Bakery (I may or may not grab a couple to take with me on my flight because I’m a fat kid). I love the seating and decor of the Bridge. Coupled with the fact that it’s pretty large with the two sides and the large windows with views of the apron make this one of my favorite airport lounges for sitting. It’s also worth noting that this is one of the better lounges for sleeping (this is maybe less true now that the first class side of the Pier has reopened) because of the TV lounge area which has enormous couches. The Bakery has a darker motif, and while the food selection isn’t nearly as extensive as the Wing or Qantas’ Business Class lounge in Hong Kong, I’m still usually pretty satisfied with the options. And they have egg tarts. There’s also a large bar on the right side of the Bridge. There’s randomly some hot food options at the bar, and they usually have some special drink on offer. The left side of the lounge has another dining area called the Bistro. Again, the food selection isn’t as extensive as other lounges, but I’m usually satisfied with the options. No egg tarts on this side, though. The left side is also likely the better side to get work done because they have Solus chairs and a computer area. And of course, if you’re fueled by caffeine, there’s a coffee bar at the end of the lounge. I don’t drink coffee, but I do eat dessert, and they had a dessert at the coffee bar that I didn’t see anywhere else in the lounge. Overall, I really like the Bridge. I don’t think this lounge gets nearly enough love given that it’s not a first class lounge, but I very happily go here when it’s convenient. Cathay does a great job with all of their lounges in HKG (well, except for the Dragonair lounge), and the Bridge is no different. This entry was posted in Cathay Pacific, Lounge Reviews, Travel, Trip Reports and tagged airport lounge, cathay pacific, hkg, the bridge, travel, trip report on July 12, 2015 by Edward. 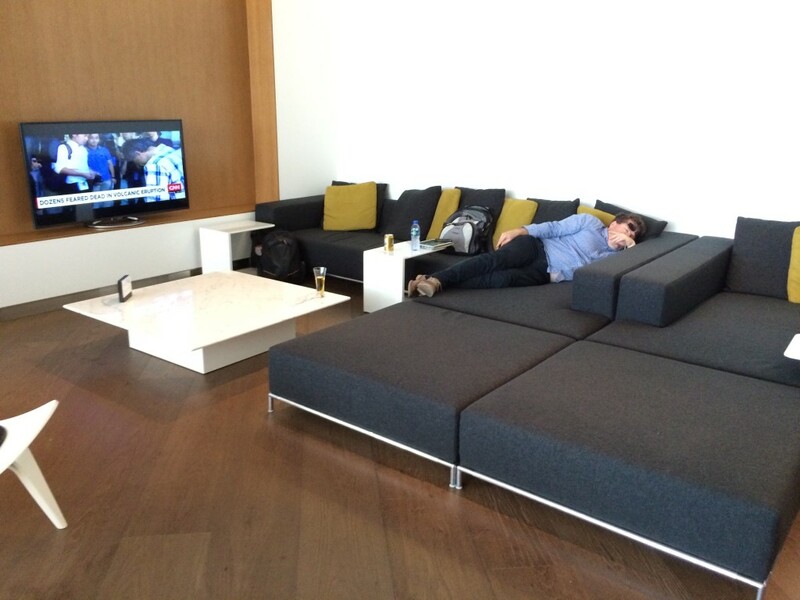 Really enjoyed this series of HKG lounge review. Thank you! Love checking in on your site. i love looking at the food and amenities on first class and business! I hate flying (although I do it quite often) but if I flew first, I’d no doubt love to fly. Thanks for giving us in inside look into the front part of life.